New Paper Accepted for Publication: Mindfulness-Oriented Recovery Enhancement Reduces Pain Attentional Bias in Chronic Pain Patients - Eric L. Garland, Ph.D.
My colleague Matthew Howard and I recently had a paper accepted for publication in the internationally-recognized journal, Psychotherapy and Psychosomatics. This paper describes a subset of findings from a randomized controlled trial (RCT) of Mindfulness-Oriented Recovery Enhancement for chronic pain patients who have been prescribed long-term opioid treatment (e.g., oxycontin, vicodin) for pain management. 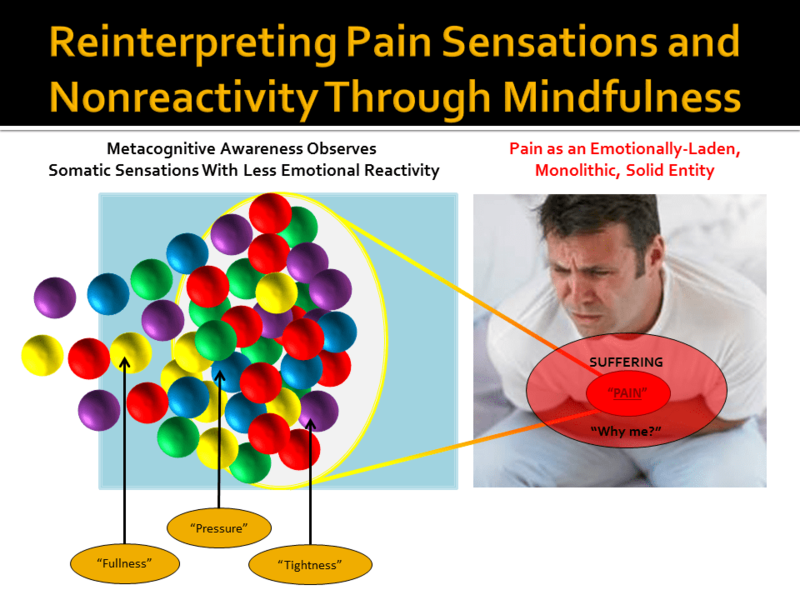 The study is the first in the scientific literature to demonstrate that a mindfulness-oriented intervention can reduce the pain attentional bias. In this study, 67 individuals suffering from low back pain, neck pain, arthritis, fibromyalgia, and other pain conditions were randomly assigned to participate in MORE or a support group and began treatment. Participants in the support group were led to disclose their feelings and thoughts about topics related to chronic pain and opioid-related problems, as well as to provide advice and emotional support for their peers. The format of the support group was similar to conventional support groups used in many medical and psychotherapy settings. We hypothesized that MORE would help participants to fixate less on their pain – freeing them to refocus on the meaningful, beautiful, or rewarding aspects of their lives. 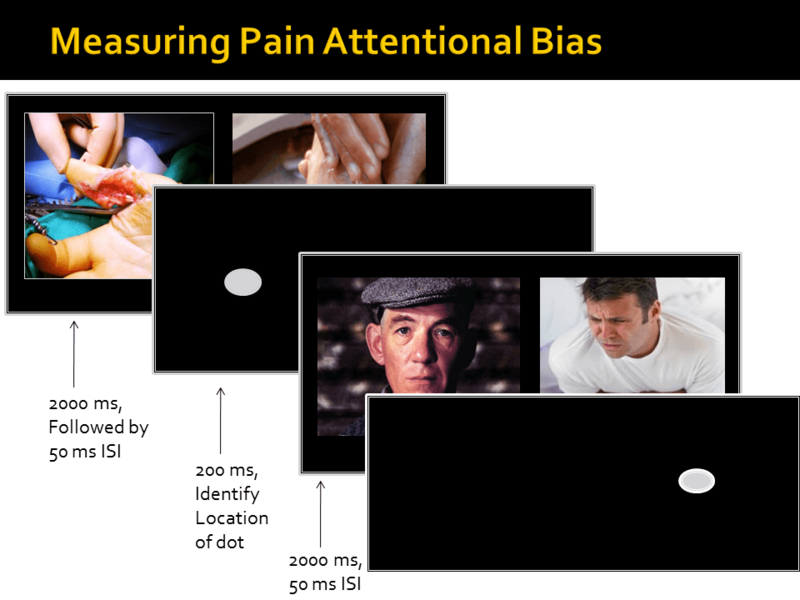 To measure attentional fixation on pain, or pain attentional bias, we used a dot probe task. In this task, participants were presented with two images, side by side, on a computer screen. One of the images was a pain-related image – the other was a neutral image. The images were presented for either 2 seconds or 200 milliseconds, and then were replaced with a dot. Participants were asked to press a button to indicate location of the the dot. Previous research demonstrates that chronic pain patients are faster to respond to pain images than neutral images, indicating that they exhibit an attentional bias, or attentional fixation, on pain-related information. Hence, people in chronic pain tend to automatically focus their attention on pain and things related to pain. This attentional fixation might occur unconsciously, without a person intending to focus on pain or even realizing that it is happening. In summary of our study results, we found that MORE led to significant reductions in the pain attentional bias, whereas the support group did not have any effect on pain attentional bias. 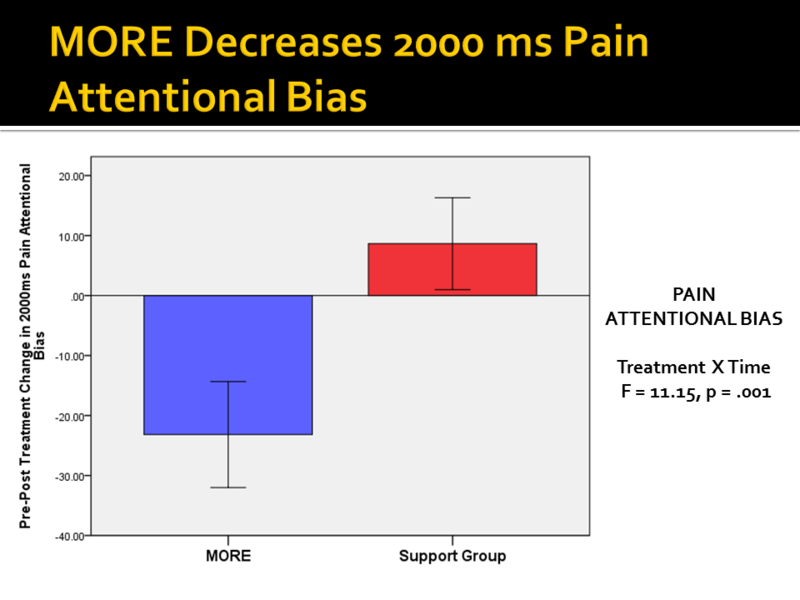 Importantly, participants in MORE who experienced the largest decreases in the pain attentional bias felt like they had greater control over their pain following treatment. In addition, those people who felt that MORE had helped them to become less reactive to negative thoughts and feelings also had less pain attentional bias following treatment. In conclusion, MORE appears to help people suffering from chronic pain and opioid-related problems learn to free their minds from fixating on pain, and in so doing, empower them to regain control of their lives. Yesterday, I posted an interview with two scholars, Dr. Garland and Dr. Mogil. Dr. Garland explained on the program his treatment method of Mindfulness Oriented Recovery Enhancement (M.O.R.E.) Here is an in depth explanation of the method and how it relates to chronic pain patients which will be published in a forthcoming article in the journal, Psychotherapy and Psychosomatics. This reblog is well worth the read.